The kantele is a type of Baltic Psaltery. The Baltic Psaltery is common in the Finno-Baltic region from Finland to Lithuania. 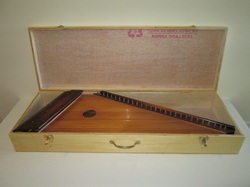 The Psaltery is a type of Zither, which also includes dulcimers and pianos. Palonen Music designs each kantele from the ground up based on your repertoire or stylistic needs. String length and tension is optimized according to the number of strings you need and the keys you need to play in. The following price list is for standard styles. Additional material costs may apply for features such as additional strings, drone strings, and semitone levers. The 11 string kantele, with a closed soundbox, is tuned diatonically to the key of D, from a low A to a high D. Great for beginners or practitioners of traditional repertoire. 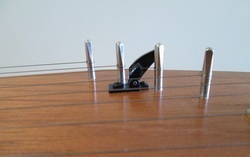 The 15 string kantele, with a closed soundbox, is tuned diatonically to the key of D, with a two octave range from low A to high A. The experienced player will wish to add semitone levers to facilitate playing in different keys and modes. The open-backed blade style kantele has a quieter sound, and is a good option for learning, practicing, or playing in your home. Semitone levers allow you to play more repertoire with a diatonically tuned instrument. Most folk repertoire is played in the keys of Bb, F, C, G, D, and A. Levers should be planned for in the design stage so that string tension will be even across the instrument. Protect your instrument with a padded plywood case designed to fit your instrument perfectly.